I was in the market today, not a farmer's market full of friendly earthy types, but a full-on London market; the kind where the stall holders wear football shirts, sovereign rings and the odd pub fight scar. The kind where they shout things like "a paaand a strawberries for a paaand" and you can buy knocked off perfume, dodgy prada handbags, enourmous packs of batteries with your fruit and veg. This particular example has been in existence since 1270 or thereabouts but isn't particularly anthing to look at, it sits in a slightly rundown bit of town off the main strip where the Starbucks and shopping malls are. However, the great thing about this kind of market is that amongst the traditional market vendors (where you can buy good to honest hard working fruit and veg) you get these little stalls selling to the various communities in the area. Wandering about today I bought a frankly astounding Jerk Chicken with Rice and Peas for lunch and filled my bag with stuff for dinner for about 15 quid. Part and parcel of why I started doing this blog in the first place was I figured I was getting stale, knocking out the same old food for dinner and not really trying anything new. So, when I spotted these bright purple aubergines (apologies to any yanks reading, no eggplant here thank you kindly) I thought "Okay! that's what I'm talking about". Unfortunatly the picture here doesn't really show off just how bright a purple these bad boys were! They are Ping Tung Long Aubergines and I'd never seen one before. The lovely Taiwanese couple gave me a couple of pointers on cooking them and I was off. I cooked them chopped into bite size chunks on a fierce heat in the wok with bok choi, lemongrass, waaaay too much garlic and chili. They are more delicate, creamier and sweeter that thier more traditional cousins and I'm pretty much sold on them, even the skins are tasty and they make for excellent comedy photos. 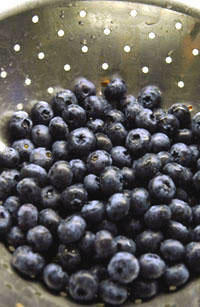 I'll leave you with the blueberries I bought for "a paaand". I'm linking to you so I can visit daily. Like your writing, suspect you have spent a bit of time in Spain/Portugal though. I might have been Jane Austen in a previous life. Yes - it's so nice to have another English food blogger, especially one who can not only spell in c'ockney, but, of course, can spell 'eggplant correctly too. Which and how much oil did you have to use with them aubergines, MG? It comes natural, I was born within the the sound of Bow Bells! Them aubergines soaked up the toasted seseame oil like a mofo, the generous shake of the bottle I threw in at first didn't cut it. I didn't want the oil to overpower so judicious use steam was called for. Mmmm. Sesame oil and aubergines. Lovely. Maybe some feta on top to make sure the lily's really guilded. Ok, that's enough work for the day - off to find some nice "eggplant". Out of interest, which London market was this? I went to the Queens Market near Upton Park a couple of weeks ago - similar thing. All these stall holders selling fruit & veg for a paaaand (and about 10 times fresher than Tesco!) surrounded by all these really exotic Asian and West-African grocers and butchers. Fab. The best of multicultural London. If you're in London, you should come to our next food blogger meet - I'll forward you the invitation!